A couple of years ago, I bought some brown cotton/linen blend fabric that was on clearance. It turned out that it wasn’t as much of a deal as I thought it was since the labeled price wasn’t the price for the whole remnant but per yard. But I bought it anyway and it sat in a bin for a long time waiting to be used. I had grand plans to make a Jedi robe with it. I even bought a bathrobe pattern that I thought I would use. For some reason I bought an adult size pattern thinking it would be easy to size it down. I don’t know why I thought this was a good idea since I don’t know how to use a pattern very well in the first place. So the fabric and the pattern sat around…they moved from Virginia to Tennessee with me. For Christmas 2012, I decided I wasn’t going to go crazy making any quilts as gifts but I wanted to make each of my kids something homemade. I decided to make Casey the first thing I had ever put in my bookmark list of “Projects To Do” which was a baby doll bassinet/basket. 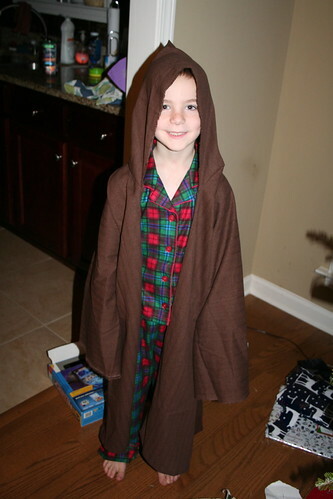 And I decided it was time to finally make that Jedi robe for Jack. Poor guy has been training for 3 years to be a Jedi and didn’t have a robe. One of my favorite blogs, Diary of Quilter, made Jedi robes for her children and directed me to a tutorial to use. I had looked at this tutorial before and I don’t know why I didn’t use it in the first place. Maybe I just needed someone to tell me how quick and easy it was. A few days after Christmas, we flew to visit family and the first thing he packed was his Jedi Robe and some inflatable light sabers so he could fight his Pop Pop. We’ve been told Pop Pop went to Jedi training school with Master Yoda. (I made sure he brought some regular clothes too.) 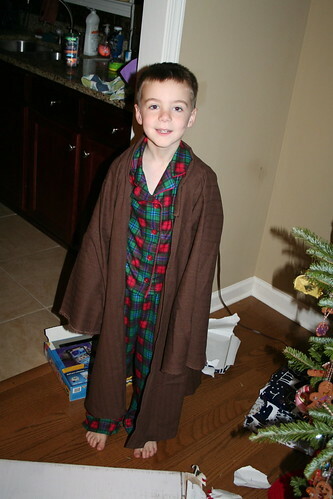 Since then, Jack has also slept in his robe and wears it for some amount of time almost every day. 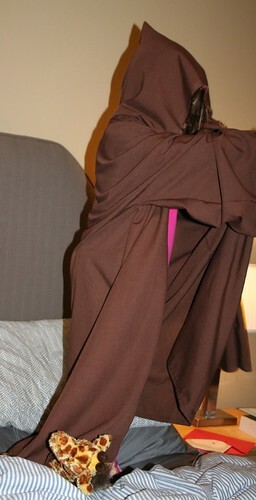 In January, Jack asked if I had any extra brown fabric because Casey really needed a Jedi robe too. I didn’t have any but I told him I would get some and I would make her a Jedi robe for her birthday that could be from him. The second robe was even easier than the first to sew. 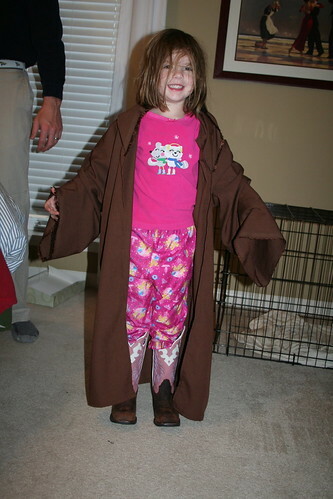 And now I have two Jedi that roam the house fighting the dark side…or each other, as the situation demands.